Australia Day Award | Murchison and District Historical Society Inc.
Murchison and District Historical Society Inc.
Members of Murchison Historical Society were delighted when their nomination for an Australia Day award was successful. John Ball, tireless worker for the Society was named Murchison Citizen of the Year for 2015 at the Australia Day celebration held in perfect weather in the grounds of our local swimming pool. Attended by 450 people, the Australia Day Committee again did a marvellous job in providing an excellent event to celebrate and express resident’s appreciation of this wonderful country in which we live. Bruce Smith did a great job as MC and Australia Day Ambassador, Tony Murphy, Director Operations and Chief Fire Officer for the Metropolitan Fire Brigade, was an inspiring Guest Speaker. As well as being on the Executive Committee of the Historical Society John Ball has been the prime mover of the building project to extend the Heritage Centre. John also volunteers many hours for other organisations in the town. He is involved with Wybalena Retirement Village, Murchison Neighbourhood House, Men’s Shed, Murchison Community Care Business Development Committee, DPJones Nursing Home and Christ Church Murchison. Described as a ‘quiet achiever’ John demonstrates the ability to stay focussed, to ‘see the big picture’ and work towards improvement for the township, so a worthy recipient of this award. To celebrate this achievement, John with family and friends, enjoyed a relaxed lunch at Longleat Winery in Murchison later that day. 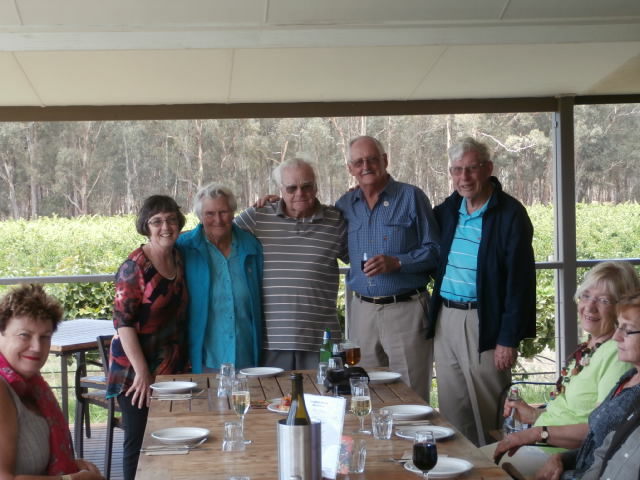 John is pictured with Historical Society members who over the years have also received an Australia Day Citizen of the Year Award – perhaps being a volunteer in Murchison is contagious? This entry was posted in Uncategorized and tagged murchison historical society. Bookmark the permalink.